Posted on November 8, 2017 by WebPublishingTeam wrote in News. 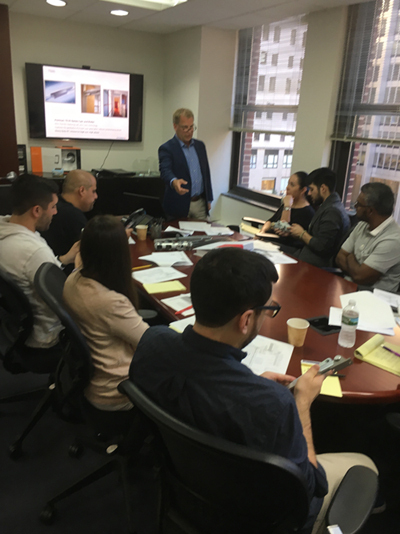 On October 20, 2017, a representative from PJ Polke Company, Mr. Dan Arthur, stopped by our Wall Street offices to a give presentation to our sales and contract department staff about various Dorma products. Dorma-Kaba is one of the top 3 global companies for security and access solutions, with sales of over 2 billion dollars. PJ Polke Co., located in Whippany, NJ, currently represents Dorma-Kaba, as well as 24 other architectural doors, frames, and hardware manufacturers, as well as a selection of security access control products and locksmith supplies. In the presentation, Dan highlighted that Dorma is the largest manufacturer of door closers in the world with almost limitless options on arms, as well as applications, whether surface, track, concealed in the header, concealed in the door, automatic and floor, and a line of cam and roller closers that are unique. Dan also talked about the pivots, exit devices, mechanical and electro-magnetic locks, and electrical strike options. Our estimating, sales, and support had a perfect opportunity to learn about many products that Dorma offers, their application and the latest news from the Dorma-Kaba family of companies. We are looking forward to seeing Dan again in the near future!